PHILADELPHIA The foundering Philadelphia Eagles fired defensive line coach Jim Washburn Monday, as they try to fix a broken pass defense amid an eight-game losing streak. 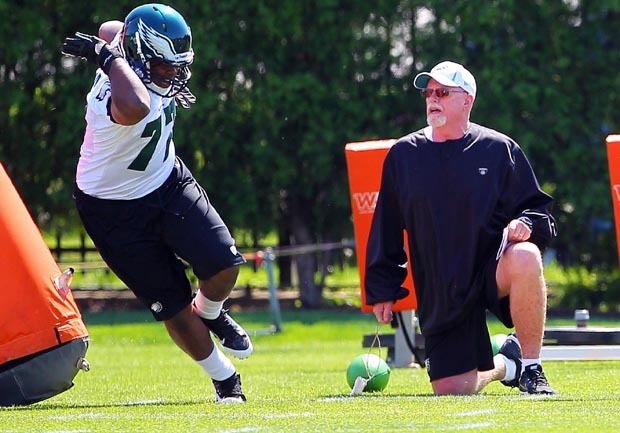 Eagles coach Andy Reid on Monday announced former defensive line coach Tommy Brasher will replace Washburn, as the team begins preparations for Sunday's date vs. Tampa Bay (6-6). The Eagles (3-9) hired Washburn before last season, expecting his wide-nine defensive line alignment to produce plenty of pressure on opposing quarterbacks. The scheme helped the Eagles tie for the league lead with 50 sacks last season but has resulted in only 20 so far this year. "Jim is a fine football coach and we appreciate the efforts he gave to this team over the past two years," Reid said. "However, I determined that it was in the team's best interest that we move in a different direction in terms of trying to maximize the production of that position group. We look forward to having Tommy Brasher back on board to work with the defensive line." Washburn's firing comes a day after the Eagles lost 38-33 to Dallas. In the win, Cowboys quarterback Tony Romo finished 22 for 27 for 303 yards and three touchdowns. Last week, the Eagles released defensive end Jason Babin, who excelled in Washburn's scheme while in Tennessee. Babin is a two-time Pro Bowl player, who had just 5.5 sacks for the Eagles this season after recording 18 last year. He signed a five-year, $28 million deal last summer after going to his first Pro Bowl following the 2010 season. Reid said the Eagles cut Babin to give more playing time to younger players. Babin was claimed off waivers by Jacksonville last Wednesday. CBSSports.com's Ryan Wilson says: "For some perspective on just how bad it's been, consider this not-so-fun fact: The Phillies have won more recently than the Eagles." This is not the first coaching move made on the defensive side of the ball as the Eagles endure the worst stretch of Reid's career. Philadelphia also fired defensive coordinator Juan Castillo. That move was made on Oct. 16, and Todd Bowles replaced him. The announcement was made two days after the Eagles lost to Detroit, 26-23, at home, and two games into what is now the eight-game skid. "You always think you have the right players here as well as the coaches," Bowles said last week. "We just have to do a better job and we haven't been."